One of the pleasures of reading, the truism goes, is the pleasure of recognition. We see in characters or settings or allusions or experiences something we know, which opens up into a whole host of secondary associations. And this is in addition to the delights of reading, in the first place, the text on the page, which the author has written without knowing just what kinds of associations it will call up in readers. 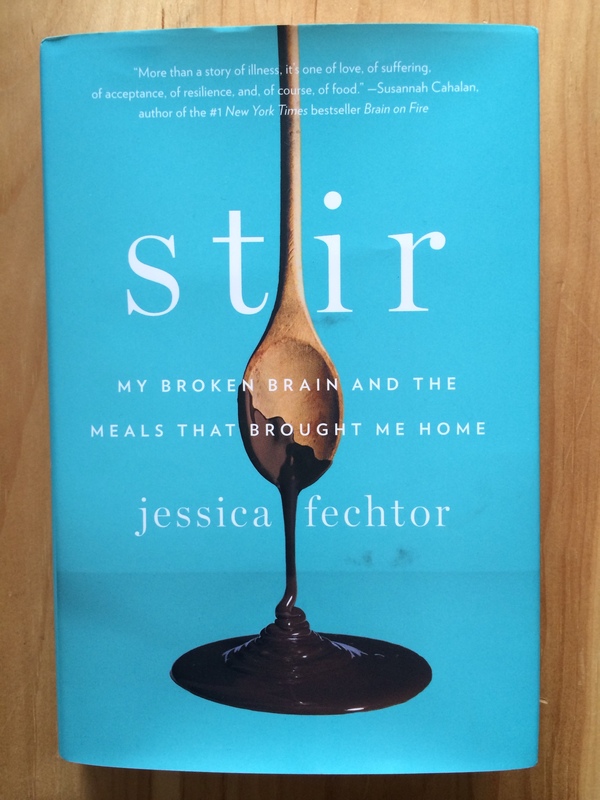 This brings me to Jessica Fechtor’s moving memoir, Stir: My Broken Brain and the Meals That Brought Me Home*, which is out today, and which was so peppered with moments of recognition for me that I kept nodding in appreciation (more on this in a little while). When she was twenty-eight, Ms. Fechtor’s calm, happy life veered quite suddenly off course. On a run one morning, an aneurysm in her brain burst, and suddenly the Harvard graduate student found herself close to death. Over the next few months, she endured multiple surgeries and infections (which left her with a facial deformity), lost the sight in one eye, and found she couldn’t taste anymore. Her plans to start a family with her husband were put on hold, as was her dissertation. This is one of the best narratives of illness (and recovery) that I’ve ever read, in part because Ms. Fechtor gives readers not just the story of her illness, but of her life before it; a bit about her childhood, more about her time in college, and most of all about the charming love story she shares with Eli, her husband. Her family and friends make this book come alive, their support for Ms. Fechtor a testament not only to their loyalty and steadfastness, but to the love she inspires in them. I was furious with myself […] for ever thinking that health was something I could count on. I’d always had excellent luck and my genes were enviable. No broken bones, maybe one cold a year, great-grandmothers and great-great aunts who lived into their nineties. I took care of myself. I ate oatmeal and kale. I flossed. I followed the rules that were supposed to keep me safe. When it turns out that she’s the patient in the bed, it was eating and cooking that helped Ms. Fechtor pave a way forward from the terrifying experience. Food and illness are always linked, of course; food helps us get well, or signals that we’re well, or tells someone we wish them well (who hasn’t delivered a casserole?). In Stir, Ms. Fechtor shares more than twenty-five recipes that have been meaningful to her, from a simple tomato soup, to her mother-in-law’s cholent and kugel, to pan-roasted salmon and baked apricots with cardamom pistachios. I loved the recipe-writing here: there’s enough backstory to give a sense of connection to the recipe’s origins, and enough detail to be precise and helpful, but they’re never overwrought. And you know the recipes are going to be good, because Ms. Fechtor is the force behind the blog Sweet Amandine, which she started during her recovery as a distraction from all the trappings of illness (as she points out, “Being sick is like walking around with a microscope strapped to your face at all times with your own body squished beneath the slide” .). It’s a gorgeous blog (this is coming from someone who used to be a food blogger), and I highly recommend it, unless you’re hungry and lacking the prospect of a good meal in the near future. The recipes are part of the recognition I was talking about at the beginning of this review; there’s a cookie recipe from the Hi-Rise Bread Company in Cambridge (one town over from where I live), a recipe for a gorgeous golden-clear chicken broth that reminds me of the matzoh ball soup my best friend’s mother makes (Hi, Mrs. Klein! ), and—wait for it—Corbo’s cassata cake. Cleveland readers know what I’m talking about: an unbelievably decadent white cake with layers of custard, strawberries, and whipped cream. It’s a cake that has bittersweet associations for me, but I’d still never turn down a slice. The cake makes an appearance in the book because Ms. Fechtor grew up in Cleveland; I did too, as you’ve probably gathered. And our graduate student years overlapped in adjacent towns, so all the Boston landmarks, culinary and otherwise, resonated with me, as did quite a few other details. And her meditations on what it’s like to be sick struck a nerve for me as well. I don’t see it that way at all. To me, only the first part is clear: Everything happens. Then other things happen, and other things, still. Out of each of these moments, we make something. Any number of somethings, in fact. Stir is a wonderful book, one that I highly recommend. One day, almost certainly, we’ll all find ourselves as the patient in the bed, or the one bringing the cookies. This book will help either way. I’m bowled over! I reviewed a book you want to read! I think you’d love it, Naomi! This does sound wonderful, like a very thoughtfully written book. I would like to read it since I am now (as you know) dealing with an illness in my family. I’m so glad this book resonated with you on so many levels! Those are rare finds. Hi Cecilia! I miss you in blogging world, but I can see that you are so, so busy! If you’re back here at all this summer, please get in touch—we’d love to see you! And I think you’d really like this book, too. Aw, thanks, Carolyn! I really hope to start writing again! I may be back this fall…I will let you know! I hope you’ve been well!